At 7:00 am this morning, a dozen brave activists released a 25-foot banner on the lawn of the EPA headquarters in Washington, DC. 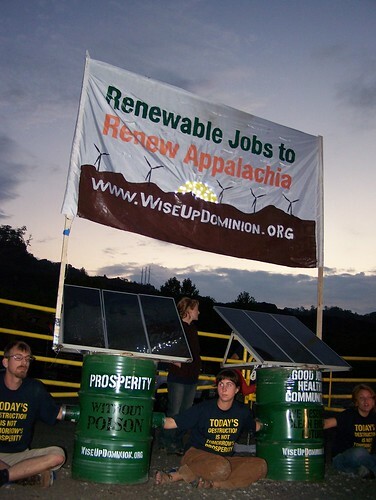 The message on the banner calls on the EPA to pledge to end mountaintop removal coal mining in 2010. But there’s a catch—the banner and two of its holders are suspended from two freestanding tripods 20-feet above the air, and after seven hours they are still hanging there with no sign of coming down. Today’s protest is an attempt to further pressure EPA Administrator Lisa Jackson to enforce the Clean Water Act and halt mountaintop removal coal mining (MTR). Called the worst of the worst strip mining, the practice blows the tops off of whole mountains and contaminates drinking water all for a tiny amount of coal. Activists in today’s protest say they won’t leave unless Administrator Jackson commits to a flyover visit of the Appalachian Mountains and MTR sites, which, shockingly, she has never done before.